Quietly Musing: Gone Batty ! Bats may conjure up visions of spooky vampires but to the Chinese it is a symbol for blessings. The Chinese character for bats Fu is a homonym for blessings. It is a recurring theme on all things Chinese from furnitures, to porcelain to gold and jade. Below are my collection of really teeny weeny jade bats. I take off my hat to the craftsmen who have so painstakinly carved these wee small bits. 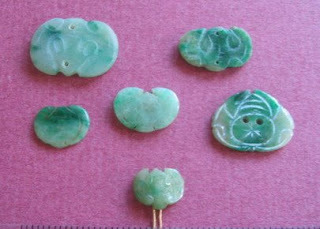 Jade is a hard material to work on and although these pieces may have been done with modern tools, still imagine holding them delicately between thumb and fingers to do the carving. The tiniest one at the bottom row is only 1cm across and with a loupe one can see the eyes and ears and expression on the bat. The artwork is very, very minute. On the revese side, there are two minute hook-like perfortions for thread to be passed through to make it into a button. The small curve and shallow channel of the perforations makes it a challenge to pass thread through it. 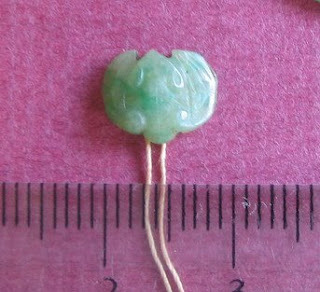 But absorping the spirit from the original jade craftsmen I painstakingly teased the thread through the holes. This is how you go about it, first use the thinnest possible wire, bent as a needle, take a deep breath concentrate hard and gently use your fingers, heart and mind to pull it through. (Hey how did this become a Zen like exercise !) What a lot of work, and being so tiny will it ever catch anyones eyes? Only jade-obsessed folk like me will look, I guess. Oh, and I'd like to mention that I had visitations from bats a few months ago. So far they have only given me their waste and I am still waiting for the "fu" !